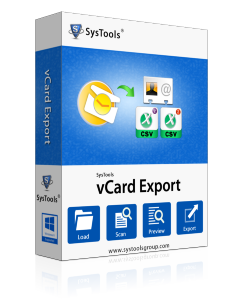 vCard Export is a feature rich application built on advanced algorithms. There are no limitations imposed by the software on the number of contacts converted. The tool supports conversion of Outlook contacts to multiple file types. The application features multiple modes for the conversion of Outlook contacts. You can either select the address book of a configured Outlook profile. Or, you can also select PST file in single or batch mode, i.e. one or multiple PST files according to the convenience. The conversion is based on progressed set of algorithms and thus, users are given the privilege to preview contacts before converting them. You can view the list of contacts present in the selected PST file or Outlook profile and preview individual contact details too. Outlook contacts can be converted to VCF, i.e. vCard file. The output vCard file is compatible with all applications and devices that support vCard. You can either create a common vCard file for all the contacts or a single vCard file for each contact. You can convert and save the contacts from your Outlook Address Book to a Comma Separated Values file (CSV). The file is accessible using Microsoft Excel and is a great medium for storing & maintaining unlimited number of contacts. The software lets you switch your Outlook contacts to Outlook Express. You can convert contacts from one or multiple PST files to a Windows Address Book (WAB) file. However, it is necessary to have Outlook Express installed on the machine during conversion. Unlimited number of contacts can be converted using the vCard Export utility in different formats. You can convert contacts from multiple address books or convert unlimited contacts from a single address book itself in VCF, WAB, Google & Yahoo format. Once the address books or contacts of Outlook profile(s) have been loaded on the software, one can choose which ones to convert. The software UI features checkboxes against each contact and each address book to promote selective conversion. The application has a very user friendly graphical user interface. Thus, the operations of the tool are not only easy for the technically sound users but also for naïve users. The UI consists of self-explanatory buttons and options that make software usage simplified. Full version of the tool is available in Multiple Licenses like personal, business oriented, or organizational respectively. All applied limitations are eliminated once the purchase is made and unlimited contact conversion can be carried out at a worthy investment. Outlook, for its personal data storage facility apart from email conversations, has become a preferable Email Client and Personal Information Manager over the time. As emails can be stored individually besides storage in its proprietary format PST, even contacts can be stored in the same manner but as vCard format. vCard being a very flexible and highly versatile contact information storage file is used by Outlook. The same file is used for contact storage in smartphones, supported on other email platforms (both web and desktop based), etc. This happens because Outlook only lets users save one contact at a time from their profile as a vCard file. Therefore, in order to save multiple of them, using a third party application becomes necessary. vCard Export fits in the scene very well as the tool is perfectly built for the conversion of Outlook contacts regardless of the output type. Not only a vCard file but the software can convert contacts from Outlook address book to a CSV for Gmail and Yahoo as well as a Windows Address Book files too. In addition to that, the conversion to vCard file also comes in a variety, i.e. either the contacts can be saved in an individual vCard file each or they can be extracted collectively into a single vCard too. Apart from that the tool comes with a freeware version for testing, other advanced features that enhances its performance, and more. Is it possible to convert contacts from Outlook to vCard altogether? Yes, you can convert as many contacts as possible from Outlook address book to any of the featured output formats. You cannot only convert multiple contacts altogether but also convert them from multiple address books. How can we extract contacts from multiple Outlook archives instantly? You can use vCard Export with Bulk File selection mode, i.e. Folder option. Once you have browsed the folder consisting of Outlook PSTs just select the output format in which you need the contacts to be converted into from those files and proceed. Note that extracting contacts to vCard will be benefitting due to the file's flexibility. What can I do to directly transfer my Outlook contacts to my Gmail profile? Is it possible to select the contacts I specifically want to convert instead of all? Yes you can convert selective contacts instead of all. The software interface comes with checkboxes provided against each contact as well as address book. Using the checkbox will determine contact to be and not to be converted. Can I check the software and know about it before making the purchase? Yes of course you can check the software before purchasing it. Download and Install the Trial of the software and run it for a demonstration of its working. The limitation would be of converting only 15 contacts to any of the output format. Apart from that the software can be operated exactly the way licensed version works.